MIAMI, Fla. – December 19, 2018 – Telemundo Deportes premieres season 2 of Que Momento (What a Moment) December 23 at 11 p.m. ET on Telemundo. The new season debuts with an in-depth look at three-time former welterweight world champion Antonio Margarito, his controversial “loaded” gloves and the rivalry with Miguel Cotto following the 2008 WBA welterweight title fight. Que Momento will take viewers back to July 26, 2008 when Margarito defeated Cotto in an 11th round TKO victory that replaced Cotto as The Ring Magazine’s No.1 ranked welterweight, and gave fans one of the most unforgettable bouts of all time. Hosted by five-time Emmy winner Andrés Cantor, the episode includes analysis and interviews with boxing personalities who witnessed the bout and closely followed the story, including both Cotto and Margarito’s trainers. The show also features interviews with other boxers that faced them in the ring, including three-time World Champion Saul “Canelo” Alvarez and seven-time World Champion Shane Mosley. 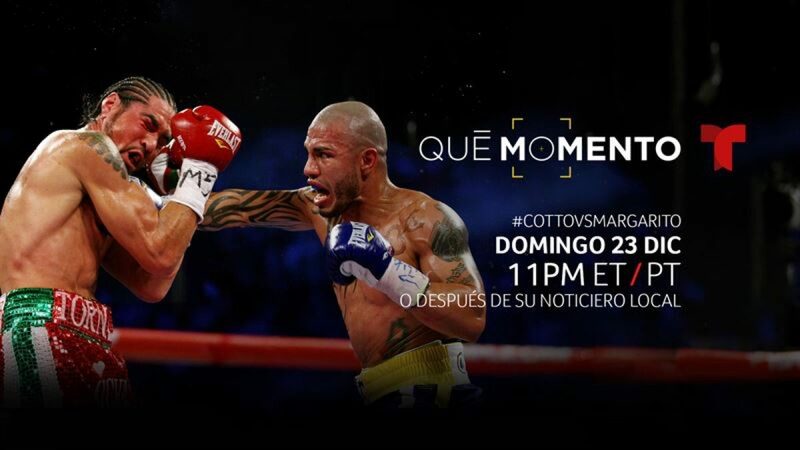 The one-hour special recounts how Cotto and Margarito came to face off in a fight that would alter the course of their careers. After Margarito, Cotto was slated to take on Oscar De La Hoya in a $25 million matchup, but the fight was off the table when Cotto lost, and Oscar opted for a fight with Manny Pacquiao. Margarito would go on make his first defense of the welterweight crown against Shane Mosley in July, 2009, in a bout that was marked by controversy. Prior to the fight, it was discovered that a plaster-like substance on illegal pads was found inside Margarito’s wraps. After his hands were rewrapped, Margarito would go on to lose to Mosley by TKO in the 9th round. Following the bout, both Margarito and his trainer were suspended by the California State athletic commission and the boxing world started to suspect that Margarito had used the same illegal substance in his wraps against Cotto. The rematch between the two rivals didn’t come until December, 2011, at Madison Square Garden, where Cotto defeated Margarito in a 10-round TKO. Que Momento was born from Cantor’s signature phrase “Que Momento,” which he uses to describe the most exciting moment in a soccer match. The quarterly special takes an in-depth journalistic look at some of the greatest and most memorable moments in sports history. The new season will feature memorable moments from baseball, soccer and women in sports. The show will return in March of 2019.